Bucks’ student-run newspaper, The Centurion, won eight awards in a statewide journalism contest, including four first place awards ranging from general news stories to best website. The winners of the 2015 Student Keystone Press Awards were released last week, and the journalism community at Bucks is ecstatic. The college went up against many other two-year schools, including the Community College of Philadelphia, Montgomery County Community College, and Harrisburg Area Community College. The Centurion won a total of eight awards this year, taking home first place awards in the top three categories: general news, ongoing news, and public service/enterprise package. Michele Haddon’s “Bucks student’s loving legacy is remembered” was awarded first place in the general news category. 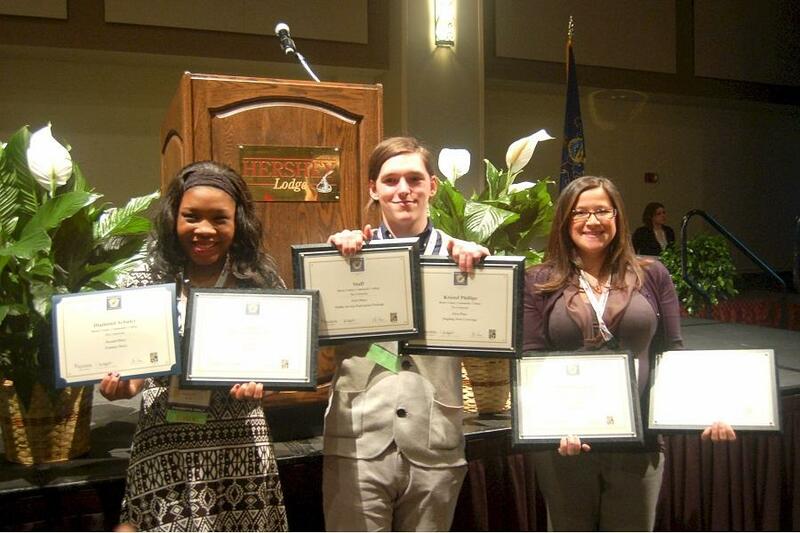 Michele Haddon, Alyssa Belardo, and Kristof Phillips were awarded first place in ongoing news for their articles that closely followed a murder investigation and trial. The Centurion staff took first place for their special report, “What makes the millennials tick?” in the public service/enterprise package category. First place in best website category was also awarded to The Centurion. The Centurion won two second place awards, Carly Pendergast’s “Great volleyball season ends” in sports and Diamond Shuler’s “Finding fall fashion on a budget” for the features category. Both were new students to Bucks and the journalism program last semester. Tony Rogers, who is a journalism professor at Bucks, and the advisor for The Centurion, was proud to hear that the student newspaper won first place awards in the top three categories. “It shows that our students can not only do really well at Bucks stories, but also real-world stories, that often tend to be sad or tragic,” Rogers said, in reference to the ongoing coverage of the murder of a beloved Bucks student, and the trials thereafter. “The students immediately get a sense that this isn’t just an assignment for a class. They’re writing for a real publication,” said Rogers. The real newsroom experience of working on the paper gives students not only an opportunity to have their work published, but to learn how to edit and work with layout and design software as well. He also mentioned that the real world experience at the paper was beneficial because it “opened doors in terms of what I want to do with my career,” and that the experience helped him realize that he really likes working with the layout aspect of the paper. Michael Girton, 21, journalism major and the co-editor-in-chief of The Centurion, is also happy with his experience on the paper. Winning an honorable mention for his review of “Big Hero 6” this year was exciting for him, but he was more content with receiving real training for his future. The Centurion is always looking for more writers and editors. Anyone is welcome to contribute to the paper; you don’t have to be a journalism student to work on the paper. You can follow the award-winning student newspaper at bucks-news.com, on twitter @Centurion_Bucks, or by picking up a copy of the paper around campus.